The role of plasma membrane in radiation-mediated cell death of mammalian cells has increasingly been recognized.,,, Ionizing radiation is known to interact with cells involving the extra- and intracellular-free radicals, which are capable of oxidative damage of cellular molecules such as DNA, proteins, and lipid membranes. Radiation-induced alterations in membrane fluidity have frequently been reported in model and cellular membranes. Studies have also shown changes in the activity of membrane receptors and proteins in irradiated cells., It has been postulated that radiation-induced membrane damage modulated the intracellular signaling in apoptosis. Reports have appeared demonstrating the role of water-soluble (e.g., Trolox) and membrane specific (e.g., α-tocopherol) antioxidants in the modification of radiation-induced apoptotic death., Membrane-associated sphingomyelinases are also known to be affected by radiation action and involvement of membrane damage-related molecules, such as ceramides and protein kinase C. It is generally accepted that structural and functional changes in cellular membrane after radiation exposure may produce critical cellular consequences including apoptotic death. Apoptosis is a distinct mode of cell destruction and represents a major regulatory mechanism in developmental processes and cellular response to external factors such as radiation and glucocorticoids. Apoptosis is characterized by many morphological features such as cell shrinkage, membrane blebbing, and chromatin condensation. It is also known to display other characteristic molecular features such as externalization of phosphatidylserine (PS) on outer membrane surface, caspase-3 activation, internucleosomal DNA cleavage, and activation/inactivation of biochemical machinery. The involvement of membrane-associated alteration in the radiation-induced apoptosis has been implicated,,, but information on the alterations in membrane permeability properties during radiation-induced apoptotic cell death is lacking. Most of the membrane permeability assays involve passive cellular entry of dyes/fluorescent probes, which depicts only status of the membrane without providing the physiological status of cells. Fluorescein diacetate (FDA) has commonly been employed for quantitative evaluation of cell viability in combination with nuclear-specific fluorescent dyes. FDA freely enters into cells and is hydrolyzed by cytoplasmic esterases to fluorescein. When the structural integrity of the membrane is intact, it remains trapped inside the cell due to its polarity. The intracellular fluorescein, however, leaks out as reflected in the reduction of fluorescence intensity in cells with their damaged plasma membrane. FDA has been considered a suitable marker to measure changes in plasma membrane permeability of thymocytes after treatment with detergents and solvents, in dexamethasone-induced apoptotic cells and in ultraviolet A-irradiated fibroblasts. In fact, the hyperpolarization of FDA has been suggested a sensitive and early marker of cellular apoptosis. In addition, translocation of PS from inside of plasma membrane to outer leaflet of bilayer serves as a molecular marker of apoptotic cell death, which can be quantified by using PS-specific probe of annexin-V labeled with fluorescein. The present work describes the radiation-induced changes in plasma membrane permeability of mouse thymocytes using fluorescence of FDA and trypan blue (TB) and its possible relation with apoptotic events PS externalization and caspase-3 activation. FDA was procured from Calbiochem, USA. RPMI-1640 and fetal calf serum (FCS) was obtained from ICN, USA. RNAase, agarose, and ethidium bromide were purchased from Sigma, USA. Phosphate buffer saline (145 mM NaCl, 5 mM KCl, 4 mM MgCl2, 7.6 mM Na2 HPO4, 2.4 mM NaH2 PO4, and 10 mM glucose, pH 7.4) was filtered through 0.45 μm pore size Millipore filter discs before using for fluorescence measurement. The animal experiments were performed according to BARC Animal Ethics Committee guidelines. Thymus glands were dissected out from 4- to 6-week-old Swiss female mice on ice cold RPMI 1640 after sacrifice of animals and the tissue obtained was smashed gently over nylon gauze. 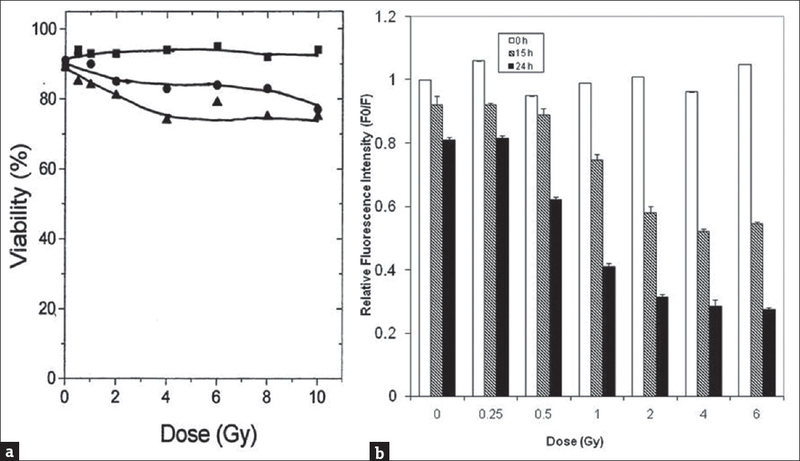 Cell suspensions (1 × 105 cells/ml) were irradiated at 4°C by 60Co γ-rays either to various doses (0.25–10 Gy) at dose rate of 0.77 Gy/min using Gamma Cell 220 (AECL, Canada). The control as well as irradiated thymocytes was centrifuged at 2000 rpm at 4°C. The cell pellet was resuspended in fresh medium supplemented with antibiotics (streptomycin 200 μg/ml and ampicillin 100 μg/ml) and 10% (v/v) FCS. The cell suspensions were incubated either at 4°C or 37°C in 5% CO2 environment. A volume of 0.1 ml of TB (0.4% in phosphate-buffered saline [PBS]) was added with thymocytes suspension (0.9 ml) taken after different incubation condition and was counted under microscope by using hemocytometer. The stock solution of FDA prepared in acetone (5 mg/ml) was diluted 50 times in PBS before labeling of thymocytes. The control as well as irradiated cell suspensions (1.8 ml) was incubated with 200 μl FDA solution at 4°C for 30 min. Subsequently, the cell suspensions were washed with 4 volumes of ice cold PBS by centrifugation (2000 rpm, 10 min, 4°C). The cell pellet obtained was re-suspended in 2 ml PBS and kept at 4°C for fluorescence measurement. Fluorescence intensity of labeled cells was measured (λex = 488 nm and λem = 517 nm) in PBS at 25°C by steady-state spectrofluorimeter (LS 50 B, Perkin Elmer, USA). Reduction in FDA fluorescence in thymocytes was expressed in terms of relative fluorescence intensity, which is the ratio between the intensity of unirradiated control at the start of (zero time) of incubation (F0) and fluorescence intensity of a particular sample (F). Percentage apoptosis in control and irradiated thymocytes was determined by annexin-V-fluorescence staining kit (Boehringer Mannheim GmbH, Germany) following the protocol provided along with the kit. From the labeled thymocytes suspension green and red cells were counted out of 400 randomly selected cell population using fluorescence microscope (Optiphot 2, Nikon, Japan). The cells showing both green and red fluorescence were considered as necrotic. Percentage apoptosis is given as the ratio between green and total (400) cells multiplied by 100. The activation of caspase-3 in control and irradiated thymocytes was measured using FluorAce Apopain Assay kit (Bio-Rad, USA). The enzymatic activity in incubated samples was estimated fluorimetrically after the different time of incubation following the protocol provided by the manufacturer. The statistical analysis was performed by one-way analysis of variance test using Origin 6.1 software (Northampton, Massachusetts, USA) at significance level 0.05. Thymocytes suspended in PBS (1 × 106 cells/ml) were incubated with FDA at 4°C and fluorescence intensity was measured with the incubation time. 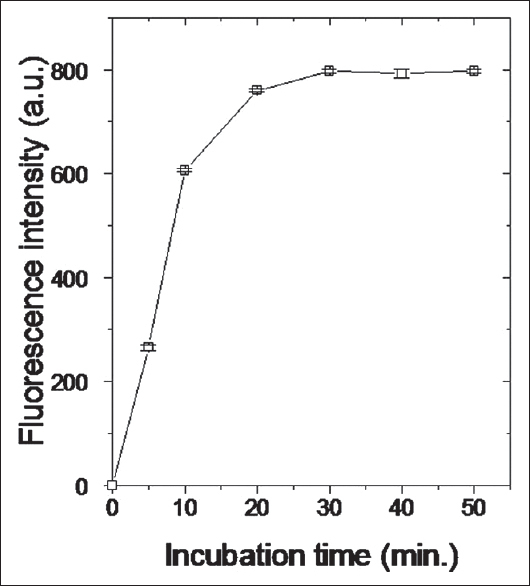 FDA fluorescence in cells was found to rapidly increase with incubation time, and saturation occurred after 30 min of incubation [Figure 1]. [Figure 2]a shows the changes in membrane permeability in thymocytes by TB after exposure to various doses between 1 and 10 Gy at 4°C followed by incubation at 37°C for 0, 15, and 24 h. As can be seen, no significant variation in TB-positive cells was observed in thymocytes immediately after irradiation. However, it was found markedly increased after post-irradiation incubation at 37°C. Compared to controls, in irradiated samples, TB-positive cells was 10% higher after 24 h, which did not follow the dose dependence [Figure 2]a.
Thymocytes exposed to varying radiation doses (0.25–6 Gy) were incubated at 37°C, and the aliquots were taken at different time intervals for labeling with FDA. It was found that FDA fluorescence in thymocytes measured soon after irradiation (<5 min) did not change significantly as a function of radiation dose. 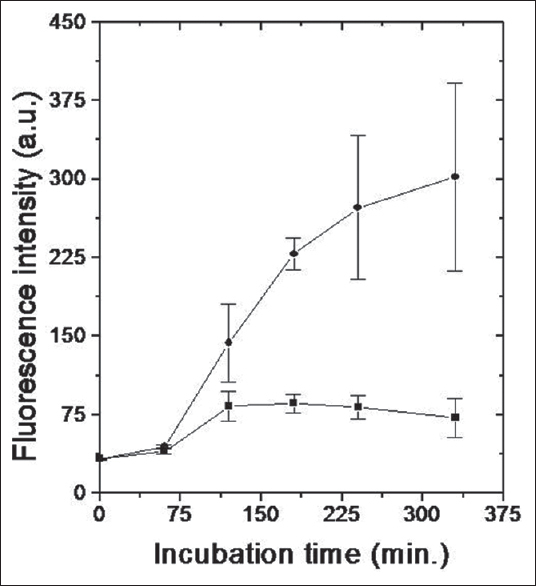 However, when measured after 15 h of incubation, a dose-dependent decrease in fluorescence intensity of FDA was found up to 2 Gy, which did not vary significantly at higher radiation doses [Figure 2]b. Incubation of thymocytes for 24 h produced a larger reduction in fluorescence intensity. It needs to be noted that significant changes in FDA labeled thymocytes were found to occur at 1 and 0.5 Gy after 15 and 24 h of incubation, respectively. 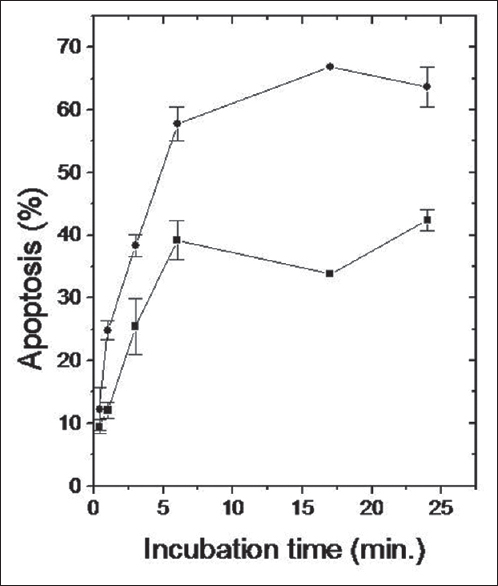 [Figure 3] shows the percentage of apoptosis in control and irradiated thymocytes with the increasing time of incubation at 37°C as determined by annexin-V method. After 15 min of incubation, about 10% of cells were found annexin positive, which gradually increased in control and irradiated thymocytes. However, in irradiated thymocytes the fraction of annexin-positive cells was markedly higher at each measurement time. After 3 h of incubation, the annexin-positive cells were 25% and 38% in control and irradiated, respectively. Control and irradiated thymocytes were incubated at 37°C and caspase-3 activity was measured after the different interval by fluorescence method. Fluorescence intensity was found to remain constant for 1 h in control as well as in irradiated samples. Control thymocytes showed a small increase in fluorescence up to 2 h but did not change significantly on further incubations. However, irradiated thymocytes showed substantial increase in fluorescence as a function of incubation time [Figure 4]. The present study describes the alterations in plasma membrane of γ-radiation-induced apoptotic thymocytes by employing TB and FDA, and associated apoptotic events using annexin-V and caspase-3 assay. The kinetics of FDA loading into thymocytes at 4°C [Figure 1] showed optimum probe incorporation within 30 min. After that, the fluorescence could be determined. The saturation in FDA kinetics observed after 30 min shows that saturation in fluorescence seems to be associated with equilibrium of reaction of intracellular enzyme (esterase) with substrate (FDA) entered inside the cell. Radiation-induced cell membrane damage is known to involve free radical reactions, which is controlled by many physicochemical and biological factors, which may have significant contribution in the induction of apoptosis. Cellular apoptosis is a dynamic process involving cascades of morphological features and biochemical processes. The sequence of apoptotic events is likely to follow various routes depending on the cell type and nature of the stimulus. Change in cellular membrane permeability was observed in irradiated human blood lymphocytes and explained in terms of changes in disorganization. It was noted that TB was insensitive to report on the damage-linked changes in membrane permeability of γ-irradiated thymocytes [Figure 2]a. However, damage in cells irradiated to doses of 50 and 100 cGy was detectable after 15 and 24 h incubation by measuring the decrease in FDA fluorescence [Figure 2]b. It is seen that FDA was able to detect changes in thymocyte membrane permeability induced by radiation where TB was rather insensitive. These results are in good agreement with the finding of Skoog el al. in UV-irradiated fibroblasts. Furthermore, decrease in FDA fluorescence in incubated thymocytes showed dose dependence up to 200 cGy followed by saturation at higher doses indicating a possibility of two sub-populations of cells: The radio-sensitive population showing decrease in fluorescence at low doses while relatively radio-resistant population did not show a decrease in fluorescence. Studies from other investigators, have indicated the existence of two populations in dexamethasone-induced apoptotic thymocytes. The unfractionated thymocytes population are enriched into double positive (CD4+ CD8+), single positive (CD4− CD8+ CD3−), and triple negative (CD4− CD8− CD3−) cells. It has been found that the double positive and single positive thymocytes are sensitive to apoptotic stimuli such as dexamethasone, etoposide, and thapsigargin than triple-negative thymocytes. The early migrant of precursor containing triple negative thymocytes are having lower susceptibility to spontaneous apoptosis and follow apoptotic pathway following CD8 expression. Percentage apoptotic thymocytes, as determined by annexin-V method, were found to increase in thymocyte population up to 6 h, which showed saturation on longer incubation [Figure 3]. The magnitude of annexin positive cells was found significantly higher in irradiated thymocytes after 1 h incubation indicating externalization of PS in apoptotic thymocyte membrane. The earliest detection of PS externalization in control and irradiated samples was in concomitant with results obtained in human keratinocytes induced with apoptosis by cumene hydroperoxide. Majority of thymocytes in thymus follow the spontaneous apoptosis since they are unable to successfully rearrange their genes or express the T-cell receptor with subthreshold avidity for self-antigen/major histocompatibility complex. The thymocytes undergoing spontaneous apoptosis were found to follow mitochondrial signaling pathway; however, it is independent of caspase-3 activation. Experiments on activation of caspase-3 following irradiation showed insignificantly small or no change in activation up to 1 h in control as well in irradiated samples [Figure 4]. However, irradiated thymocytes showed a rapid increase in caspase-3 activity with the period of incubation and the magnitude of activation in irradiated samples was about four folds higher compared to controls after 4 h. However, in the control samples increase in caspase-3 activation was insignificant. These results suggest that radiation-induced apoptotic death in thymocytes follow caspase-3-mediated pathway, while the control thymocytes follow caspase-3 independent route. Irradiation of thymocytes results, the non-apoptotic cells to undergo apoptosis by caspase-3-mediated pathway. The FDA fluorescence showed a significantly higher sensitivity for monitoring of thymocyte membrane permeability induced by radiation than TB. FDA fluorescence measurement can be an indicator of radiation exposure to cells in therapeutic dose range. Externalization of PS in radiation-induced apoptotic thymocytes seems to occur before caspase-3 activation and membrane permeability alterations. Results indicate that radiation-induced apoptosis follows caspase-3 activation route, which may consequent to loss of lipid asymmetry. The increase in membrane permeability in irradiated thymocytes seems to be later and secondary event in apoptotic process. Stark G. The effect of ionizing radiation on lipid membranes. Biochim Biophys Acta 1991;1071:103-22. Ramakrishnan N, McClain DE, Catravas GN. Membranes as sensitive targets in thymocyte apoptosis. Int J Radiat Biol 1993;63:693-701. Ojeda F, Diehl HA, Folch H. Radiation induced membrane changes and programmed cell death: Possible interrelationships. Scanning Microsc 1994;3:645-51. Vincent-Genod L, Benderitter M, Voisin P. Micro-organisation of the membrane after radiation-induced apoptosis: A flow cytometry study. Radiat Environ Biophys 2001;40:213-9. Halliwell B, Gutteridge JM. Free Radicals in Biology and Medicine. 2nd ed. England: Cleardon; 1989. Pandey BN, Mishra KP. Fluorescence and ESR studies on membrane oxidative damage by gamma radiation. Appl Magn Reson 2000;18:483-92. Yatvin MB, Cramp WA, Edwards JC, George AM, Chapman D. Effects of ionizing radiation on biological membranes. Nucl Instr Meth Phys Res 1987;A255:306-16. Cregan SP, Smith BP, Brown DL, Mitchel RE. Two pathways for the induction of apoptosis in human lymphocytes. Int J Radiat Biol 1999;75:1069-86. Fuks Z, Haimovitz-Friedman A, Kolesnick RN. The role of the sphingomyelin pathway and protein kinase C in radiation-induced cell kill. Important Adv Oncol 1995;19-31. Radford IR. Initiation of ionizing radiation-induced apoptosis: DNA damage-mediated or does ceramide have a role? Int J Radiat Biol 1999;75:521-8. Lucas M, Sánchez-Margalet V. Protein kinase C involvement in apoptosis. Gen Pharmacol 1995;26:881-7. Kerr JF, Wyllie AH, Currie AR. Apoptosis: A basic biological phenomenon with wide-ranging implications in tissue kinetics. Br J Cancer 1972;26:239-57. Mower DA Jr., Peckham DW, Illera VA, Fishbaugh JK, Stunz LL, Ashman RF. Decreased membrane phospholipid packing and decreased cell size precede DNA cleavage in mature mouse B cell apoptosis. J Immunol 1994;152:4832-42. Rotman B, Papermaster BW. Membrane properties of living mammalian cells as studied by enzymatic hydrolysis of fluorogenic esters. Proc Natl Acad Sci U S A 1966;55:134-41. Aeschbacher M, Reinhardt CA, Zbinden G. A rapid cell membrane permeability test using fluorescent dyes and flow cytometry. Cell Biol Toxicol 1986;2:247-55. Ormerod MG, Sun XM, Snowden RT, Davies R, Fearnhead H, Cohen GM, et al. Increased membrane permeability of apoptotic thymocytes: A flow cytometric study. Cytometry 1993;14:595-602. Skoog ML, Ollinger K, Skogh M. Microfluorometry using fluorescein diacetate reflects the integrity of the plasma membrane in UVA-irradiated cultured skin fibroblasts. Photodermatol Photoimmunol Photomed 1997;13:37-42. Zurgil N, Schiffer Z, Shafran Y, Kaufman M, Deutsch M. Fluorescein fluorescence hyperpolarization as an early kinetic measure of the apoptotic process. Biochem Biophys Res Commun 2000;268:155-63. Pandey BN, Mishra KP. Radiation induced oxidative damage modification by cholesterol in liposomal membrane. Radiat Phys Chem 1999;54:481-7. Leist M, Jäättelä M. Four deaths and a funeral: From caspases to alternative mechanisms. Nat Rev Mol Cell Biol 2001;2:589-98. Wang JF, Jerrells TR, Spitzer JJ. Decreased production of reactive oxygen intermediates is an early event during in vitro apoptosis of rat thymocytes. Free Radic Biol Med 1996;20:533-42. Chow SC, Snowden R, Orrenius S, Cohen GM. Susceptibility of different subsets of immature thymocytes to apoptosis. FEBS Lett 1997;408:141-6. Shvedova AA, Tyurina JY, Kawai K, Tyurin VA, Kommineni C, Castranova V, et al. Selective peroxidation and externalization of phosphatidylserine in normal human epidermal keratinocytes during oxidative stress induced by cumene hydroperoxide. J Invest Dermatol 2002;118:1008-18. Zhang J, Mikecz K, Finnegan A, Glant TT. Spontaneous thymocyte apoptosis is regulated by a mitochondrion-mediated signaling pathway. J Immunol 2000;165:2970-4.